Shasta Lake history is rich and intriguing. The lake’s many arms and inlets make it a paradise for explorers and boaters alike. The four major arms of the lake offer spectacular scenery as well as unusual geologic and historic areas of interest. Much of Shasta Lake’s 29,500 acre surface area is accessible only by boat. This brief guide will point out some of the most outstanding features in and around each arm of the lake. 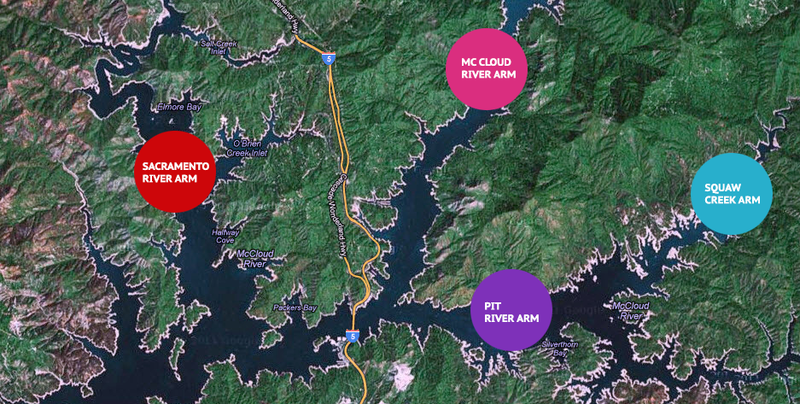 This is the busiest and most developed arm of Shasta Lake. The historic route of the Oregon Trail and the Central Pacific Railroad lie submerged below its surface. Interstate 5, the Oregon Trail’s modern replacement, provides easy access to most of the areas on the Sacramento Arm. Shasta Dam, at the lower end of the arm, is the highest center spillway dam in the United States and one of the largest concrete structures ever built. The 602 foot high dam is 3/3 of a mile wide and contains 6.3 million cubic yards of concrete. The Vista House near the dam offers films and displays showing highlights of dam construction during the 1940s. Directly north of the dam and under about 400 feet of water lies the copper mining town of Kennett founded during the gold rush of the 1850s. Kennett’s population boomed to nearly 10,000 residents in the early 1900s due to the high demand for copper which was more prevalent than gold in the surrounding hills. Sulphur damage from the town’s five smelters destroyed nearly all the vegetation within a 15 mile radius of the town and, combined with declining copper prices after World War 1, led to the demise of the town after 1925 and the closing of the smelters. Near the convergence of the Pit and Sacramento Arms is Slaughterhouse Island, so named because the slaughterhouse for Kennett sat in the saddle between what is now Slaughterhouse Island and the island to the south of it. Elmore Bay was named for the Elmore Ranch which was inundated by the rising waters of Shasta lake. From the Goosenecks north, watch for red volcanic looking rocks, called basalt, lining the shoreline. It occurs particularly on the west shore. This is lava from the Mt. Shasta area which was cut through by the erosive action of the historic Sacramento River. In some areas near Antlers the basalt forms crude columns similar to those found at Devil’s Postpile National Monument. At the north end of the Sacramento Arm are the Lakehead/Lakeshore area resorts and campgrounds. That’s where the Neu Lodge Motel is located. Antlers was originally a railroad stop at the hotel adorned with deer antlers. Across from Antlers Resort is Indian Creek and a short way up the creek is a waterfall, a popular side trip on a hot day. The Sacramento Arm of Shasta Lake ends near Riverview, an old resort site. Now a day use area, this site has one of the few sandy beaches on the lake. It’s a local secret, but we’ll tell you how to get there. Named after Alexander R. McCleod, a Scot fur trapper who was snowbound along the river in 1829 before little of the land was ever developed. In 1872, Livingston Stone established the first West Coast salmon hatchery near the convergence of the McCloud and Pit Rivers. The facility, which grew to resemble a small town, was called Baird in honor of the first commissioner of fishing. Seven years later, a trout hatchery was established at Green’s Creek farther up the river. Rainbow trout from this hatchery were transplanted all over the world and most strains of rainbows are descendants of the McCloud River trout. Above the McCloud Arm are towering grey limestone mountains, formed from ocean sediments that accumulated 200 – 300 million years ago. The Grey Rocks, as they are called, are full of the fossilized remains of corals, snails, clams and other sea creatures that existed in prehistoric times. Water running through cracks in the formation have slowly opened up two fairly well known caverns within the mountains. Local Wintu Indians knew the caverns well and told Livingston Stone about them. Livingston was the first European to visit the caverns. Commercially operated, Shasta Caverns are open to the public with daily guided tours. Samwel Cave, also known as the “Cave of the Lost Maiden,” is located about two miles south of the McCloud Bridge. The cave was believed to contain magic pools in which the Wintu Shaman (medicine men) would bathe. It is also known for its treasure of Ice Age fossils which were found at the bottom of a 70 food deep pit. Also in that pit were the skeletal remains of the “Lost Maiden” which lent credence to the old Wintu stories. The variety and quality of remains excavated from the cave are surpassed only by those from the La Brea Tar Pits in Los Angeles. A self guided trail leads up to Samwel Cave from Point McCloud. All but the first room is closed to the public because of the danger of falling to the bottom of the deep pit inside the cave. Spelunkers can explore the inner reaches of the cave by obtaining a special permit issued by the Shasta Lake Visitor Center. This part of Shasta Lake is rugged and remote. Gravel beaches and numerous fingers reach out into the channel making it one of the lake’s most popular houseboating areas. For the first several miles up the arm the shoreline is less steep and many desirable undeveloped campsites dot the shore. This arm is also home to a large concentration of wildlife. Eagles, osprey, otter, bear and Rocky Mountain Elk are likely to be seen. Some shoreline areas are closed to protect critical habitats. Please respect these closures by staying out of designated areas. To the north, the ruins of Bully Hill Mines can be seen on a flat just above the north shore of the lake. A popular sightseeing destination, the massive ruins of the smelter, the remains of some of the buildings, and, in season, grapes, figs and plums make the visit worthwhile. Bully Hill was one of five major local mines located in the area prior to the construction of Shasta Dam. Transportation problems, the presence of zinc in the copper ore, and lawsuits against the mines for sulphur fume damage to vegetation led to their closure. This area was first mined for its copper by the Wintu Indians. Hundreds of Chinese laborers followed and mined over three miles of the creek bed. The ore yielded 98 percent pure copper, but it had to be shipped to the Atlantic Coast for refining and therefor was not profitable. Later, Captain Delamar of Utah built the Bully Hill smelter and started processing copper locally. The town of Delamar, named for the Captain, grew up below the smelter. In its heyday, the mine and smelter employed 2000 men and the town of Delamar housed two to three times that many people. Horses and mules moved the ore from the mine to the smelter or to Copper City downstream. Today, the shoreline of Shasta Lake usually laps at Main Street, about mid way through Delamar. Above the townsite, old gates mark the entrance to the Bully Hill Mine and Smelter complex. Mountains of tailings, dumped after the ore was ground up by hard milling stones brought from Sweden, surround the crushing area of the plant. This is the longest arm of Shasta Lake. From its convergence with the Sacramento Arm, near Shasta Dam, it stretches nearly 30 miles east to its upper end at the base of Pit Reservoir #7 near Fenders Flat. The lower part of the Pit is a wide basin with grand vistas. Mt. Shasta is visible to the north and Mt. Lassen and the Lassen Range backdrop the views up the Pit. Bass Mountain to the south and O’Brien Mountain to the north of the channel are examples of volcanic mountain building processes. Each is a 400-year-old volcanic plug. About 50 million years after the formation of these peaks, sea deposits began accumulating around them. These deposits were later compressed into the limestones which now form Grey Rocks. These formations flank both sides of the Pit River just east of its junction with McCloud. At the bottom of the canyon lie the remains of the Sacramento Valley and Eastern Railroad – a line built at company expense to link the mines at Bully Hill on the Squaw Creek Arm, to the Southern Pacific lines along the Sacramento River. The largest inland marina on the West Coast is located at Bridge Bay. High above Bridge Bay and Shasta Lake is the Pit River Bridge, the highest double decker bridge in the United States. Early day travelers crossed the river via ferries. At the Silverthorn peninsula farther east, the Pit turns sharply south and begins to narrow. This is called the Upper Pit. After passing Jones Valley inlet, there are no services and camping is limited to three primitive boat access only campgrounds. This is Shasta Lake’s “outback.” It is home to eagles, osprey, otters and bear. It is considered by many to have the best bass fishing on the lake. Dozens of coves and inlets line the forested shores offering quiet, secluded campsites. The Upper Pit was not cleared prior to the completion of Shasta Dam. World War II broke out about the same time as the clearing crews got to the junction of the Pit and Squaw Arms and most of the men on the clearing crews left for the war. Dead snags sometimes lend an eerie appearance to the shoreline here and they can be a hazard to boaters. Because of this, waterskiing has been prohibited above Arbuckle Flat. Near the upper end of the arm, the channel becomes very narrow and the canyon walls are extremely steep. At Bear Creek, a short hike leads to a double waterfall known as Bear Creek Falls. A larger waterfall, Potem Falls, can be found on Potem Creek near Fenders Flat. This fall can be reached by trail from the lake or seen from Fenders Ferry Road.